A Doll House (literally translated A Doll's home from the original Norwegian title Et dukkehjem) is an 1879 play by Norwegian playwright Henrik Ibsen. 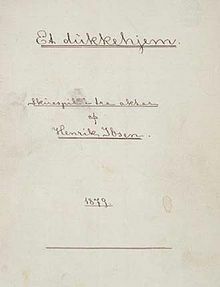 A Doll House, written two years after The Pillars of Society, was the first of Ibsen's plays to create a sensation and is now perhaps his most famous play, and required reading in many secondary schools and universities. The play was highly controversial when first published, as it is sharply critical of 19th Century marriage norms. It follows the formula of well-made play up until the final act, when it breaks convention by ending with a discussion, not an unraveling. It is often called the first true feminist play, although Ibsen denied this. — Excerpted from A Doll's House on Wikipedia, the free encyclopedia. The action takes place in Helmer's house. This page was last edited on 2 February 2013, at 14:04.